A blog exploring the pleasures of gardening in Montgomery County, Maryland, USA. Hibisicus syriacus, the rose of Sharon, was regarded as a weed tree where I grew up. Every flower seems to set seed, and every seed seems to germinate – if not immediately, sometime during the next century. Decades ago I planted one of the standard cultivars, ‘Blue Bird’. This one sets seed prolifically, and I eventually ripped it and its teeming progeny out. Or I thought I did: I’m still pulling them. Also, the flowers of these plants are ephemeral, and the accumulation of fallen flowers beneath the bushes can make a mess. In an earlier post (see here: http://mcwort.blogspot.com/2009/08/hibiscus-syriacus-blue-satin.html ) I mentioned that when the National Arboretum introduced its handsome seed-free cultivars, that group did not include a blue-flowered form. I’ve been waiting patiently for a seed-free blue to appear, and we now have a readily available one: ‘Azurri Blue’. These blue-flowered forms are best viewed in the early morning: midday bright sun brings out the pink tones. 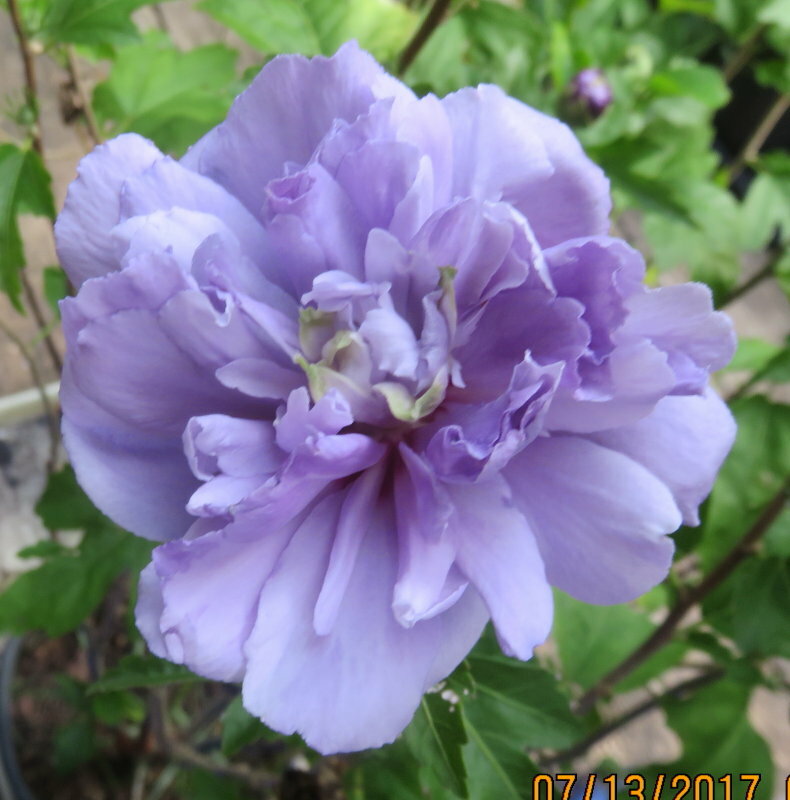 Evidently there is a lot going on among hybridizers with Hibiscus syriacus. It’s a group I’ve largely ignored for a long time, so when I began to Google the group, I discovered that a lot has happened. One which caught my eye is ‘Blueberry Smoothie’. The images on line flatter it a bit I think, a point of view confirmed when I saw the plants in a nursery. But those plants were pot grown, and I have a hunch that more water will bring better flowers. My ‘Azurri Blue’ came from Proven Winners, and the little tags which came with it gave me something to think about. These tags give information in both English and Spanish. On one tag the Spanish language version of the name was given as “la rosa de Siria”; on another it was given as “la rosa de Sarón" . “Sarón”, a misprint for “Sharon”, right? No, it’s “Sarón” and I think I know why: it’s “Sarón” for the same reason that the late Shimon Peres was Shimon and not Simon Peres. The name Simon came into European languages from translations of Hebrew texts, and those earliest translations were from Hebrew into Koine Greek. Neither Greek nor Latin in their classical periods had a way of writing the “sh” sound, and it presumably did not exist in the spoken languages. So a Hebrew name such as Shimon was transliterated as Simon. And so the Hebrew Sharon, the name of a plain west of Jerusalem, became Saron in those western languages which got the word early on from Greek and Latin texts. Rosa moschata "Graham Stewart Thomas"